Jumpstarting a car with a dead battery can seem like a difficult task but it is not. Follow these 10 easy steps and jumpstart your car like a pro. 1. Park the car with a charged battery with its front facing the car with a dead battery close to one another. Never let the cars touch and leave at least 15 inches of space between. 2. For manual transmissions, make sure car is in Neutral. For cars with automatic transmissions -place car in Park. Turn off both engines and set the parking brake on both cars. 3. Now grab your jumper cables. Notice that each set of clamps has one red clamp and one black clamp. 4. Open car hoods and locate the batteries and battery terminals. Terminals are, in most cases, marked in black or red, or with a “+” and “–“ sign on top or right next to the battery terminal. Make sure that you have identified which is negative and which is positive. 5. First, connect the red cable to the positive battery terminal (“+”) of the dead battery. Make sure that there is a solid connection to the battery terminal and that the clamp is not sliding. 6. Second, clamp the other end of the red cable to the functioning car’s positive battery terminal (“+”). 7. Next attach the black cable clamp to the working battery’s negative (“-“) terminal. 8. Now the tricky part. Do not connect the last black cable clamp to the dead battery’s positive battery terminal. Connect that clamp to a metal, unpainted part of the car, for example a clean nut on the engine block or vehicle chassis. 9. Start the car with the good battery and wait a minute before trying to start the car with the dead battery. 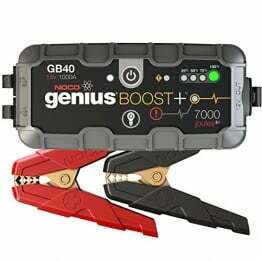 Sometimes, especially if you are trying to jump start similar or slightly bigger engine than the one in the running car, it helps to rev the vehicle with the good battery a bit. This should prevent the engine from stalling. Once both vehicles are running, let them run for a few minutes. 10. Start with the black cable clamps when disconnecting the jumper cables and do not let them touch any part of the cables or the car.